Frederick William Cottle, known as Fred, was born in 1888 in Framilode, the son of Joseph Cottle (a waterman) and Rosa Anne née Hill. He was one of four children and his two brothers Joseph Charles and Joseph Thomas both served in the war. In 1901, at the age of 12, Fred was being trained for the sea in HMS Formidable and stationed at Portishead, and on the night of the 1911 census he and his widowed father were recorded in their three-roomed cottage in Lake Lane, Frampton. Fred's marriage to Ethel Jones was registered in the Wheatenhurst district during the first quarter of 1915, and they subsequently had three children: Charles, Amy and Olive. Although Fred’s service records do not survive, the Silver War Badge roll states that he enlisted on 8 December 1915 in the 14th (Service) Battalion (West of England) Gloucestershire Regiment as a Private. The Battalion formed part of the 105th Brigade, 35th Division which landed at Le Havre on 30 January 1916, concentrating east of St Omer. The Division were in action during the Battles of the Somme at Bazentin Ridge, Arrow Head Copse, Maltz Horn Farm and Falfemont Farm, and in 1917, during The Pursuit to the Hindenburg Line, at Houthulst Forest and The Second Battle of Passchendaele. It is not known where Fred fought, but at some stage he was wounded and his discharge came on 31 August 1918. It is believed that he had his leg blown off and lost a finger too. He was awarded the British War Medal and Victory Medal and is commemorated on the plaque in Frampton Village Hall. Post-war Fred was aided by an artificial limb and able to work as a cobbler. He lived in Lake Lane, in the end house next to Cadbury Hall, and later at 12 Bridge Road. 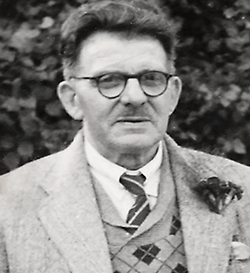 Frederick William Cottle was buried in St Mary’s churchyard on 6 February 1966.